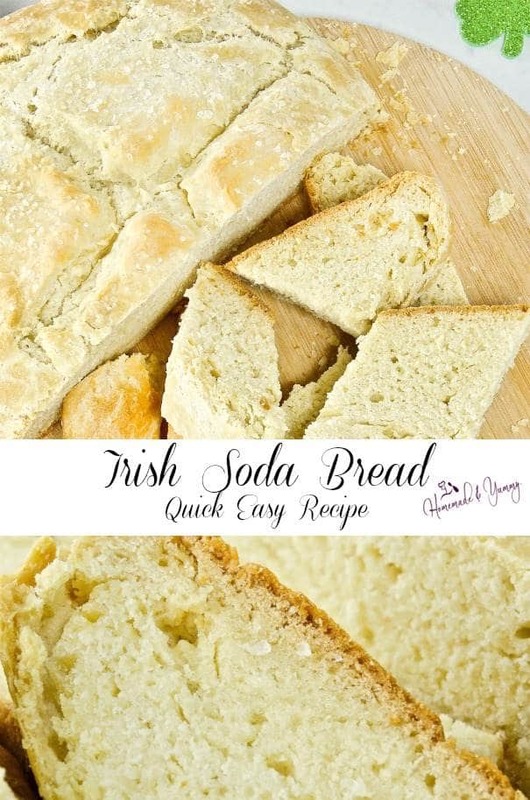 Irish Soda Bread Quick Easy Recipe| Homemade & Yummy Homemade & Yummy | Fun delicious recipes and more. Nothing beats homemade bread. 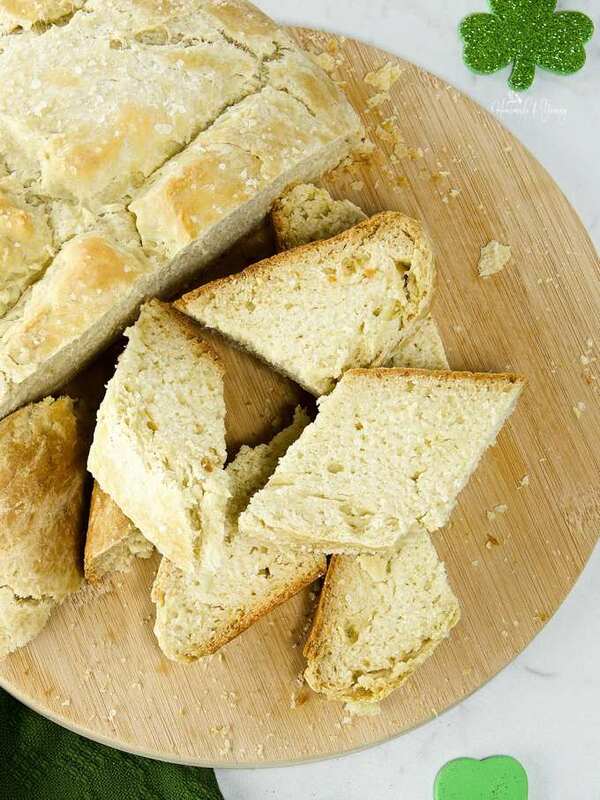 With this Irish Soda Bread Quick Easy Recipe, you can have freshly baked bread in no time. No kneading. No rising. No waiting for HOURS! Perfect for any night of the week. Quick, easy and delicious, your house will smell like a bakery. 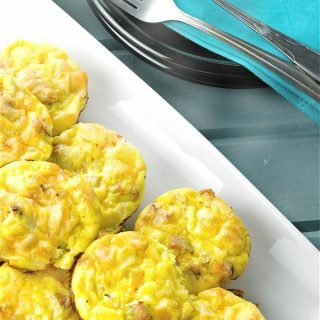 Great for breakfast, lunch, and dinner. Celebrate St. Patrick’s Day with this easy soda bread recipe. I happen to love making homemade bread. Unfortunately, we always don’t have the time. Simple and easy Irish Soda Bread is the answer. You can whip this bread recipe in minutes. 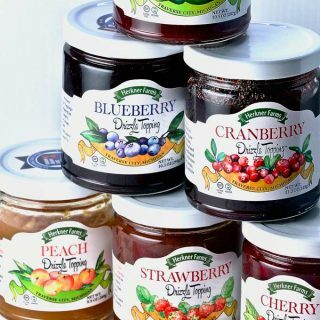 The perfect side to soup, stew,(especially Irish stew) and chili. If you are like me, breaking off a hunk of bread and slathering it with butter is fantastic. There is something about the aroma of bread baking. That is my favourite part of visiting a bakery. Delicious sweets are one thing, but freshly baked bread is one of my favourite foods. There is not a type of bread I have not liked. This soda bread is a favourite around here. If you are a crusty bread lover, this is for YOU! Ingredients found in your pantry right? If you don’t have buttermilk don’t worry. Check below for some easy substitutions. This bread recipe is easy as 1-2-3. Let me tell you, making bread does not get easier than this. I thought scones and cornbread were easy to make. This recipe for Irish soda bread is even easier. I really don’t think you can screw this up. Well ok, I guess you could burn it. I really don’t think this will happen. Once that aroma of this delicious and simple bread recipe starts wafting through the house, you will be checking the oven. I am always eager to break off a hunk of this quick and easy bread and slather on the butter. SOOOOO GOOOOOD!!! If you search the net you will find LOTS of different soda bread recipes. Some have nuts, seeds, and raisins. Traditionally it was made with NO butter and NO white flour. I think we have sort of customized it to our tastes. So if you have never made Irish Soda Bread, let me give you the Coles notes directions. You will be a baking bread like a pro in no time. No bread machine needed here. Place the flour, baking soda and salt in a large bowl. Mix with your hands to combine. Turn dough onto floured surface and mix until it forms a ball. If you don’t have buttermilk on hand, no problem. There are buttermilk substitutes you can use. Alternatively, you can also use buttermilk powder mixed with water. For this Irish Soda Bread recipe, I did use butter and a bit of sugar (I know, breaking tradition), and I also sprinkled coarse salt on the top before baking. I have baked it in a cake pan, and a cast iron skillet (it takes a little longer). We prefer the old fashioned way. Just plop it onto a baking sheet. Makes a great rustic looking loaf. Do you know why they score the top? Folklore states: “to let the fairies out”. Making bread does not have to be time-consuming and complicated. 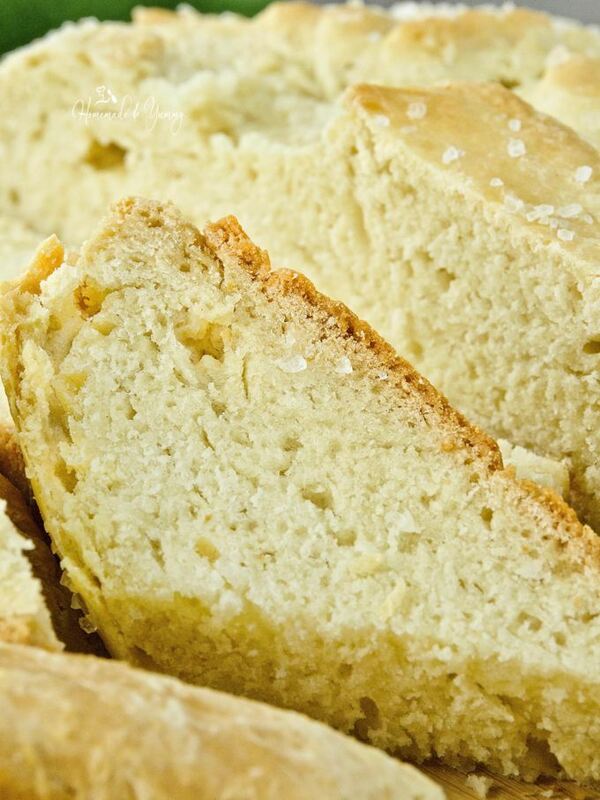 This Irish Soda Bread Quick Easy Recipe makes an appearance quite often on our dinner table. It disappears in a flash. Hope you give this easy to make homemade bread recipe a try. Do you have a favourite quick bread recipe? Irish Soda Bread Quick Easy Recipe is just what you need to make freshly baked bread any day of the week. No yeast, no rising, no kneading. You only need 4 ingredients to make this soda bread recipe. Enjoy on St. Patrick’s Day, and all year long. Preheat oven to 350º F and choose your preferred baking pan, sheet or cast iron skillet. I just used a parchment lined baking sheet. 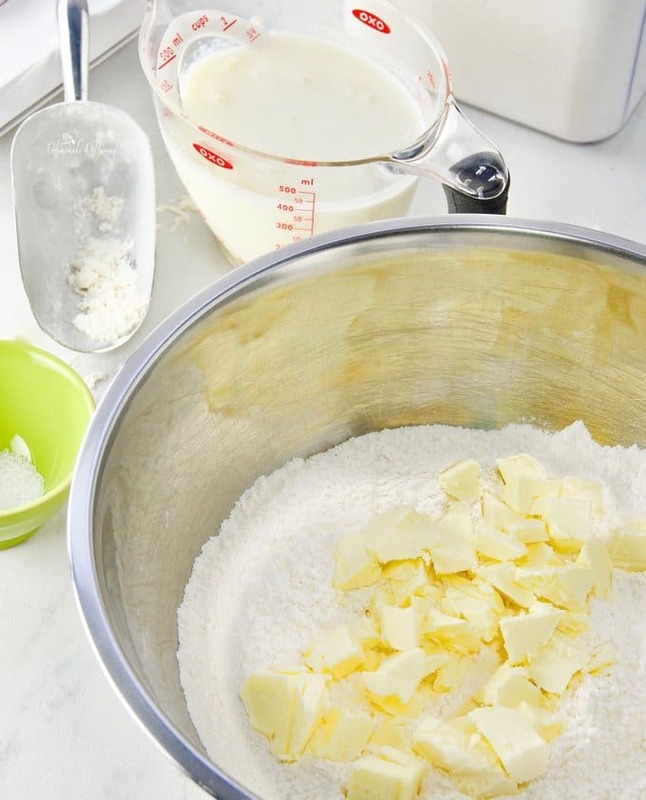 In a large bowl add the flour, sugar, baking powder, baking soda, and salt. Whisk to combine. Add the buttermilk (not all at once) and mix with your hand until moist. Turn dough onto floured surface and blend until it forms a round ball. Flatten with your hand slightly to form a disc about 7-8 inches across. Place on baking sheet. Score an X on the top with a sharp knife (about 1/2 way through the bread. At this point, you can top with the coarse salt if you like. Bake in the oven for about 50 minutes. Check with a cake tester. The top should be browned, and the bread will have a hollow sound when you tap on the bottom. Remove to a wire rack to cool. At this point, I am ready to rip off a chunk!! ***NOTE** If you choose to bake this in a cast iron skillet, you will have to allow for more time as it takes time for the skillet to heat in the oven. DO NOT heat the skillet before putting the bread in to bake. Well, I think the fairies did their magic to the bread before you cut the dough and let them out. It’s a beautiful loaf and I bet it is perfect go-along with any meal. We are huge bread lovers and I’d love to have a warm slice slathered with butter. So yummy! I’m keeping this in mind for St. Patrick’s Day. I love the “fairy” part…such a fun little tip for this easy to make recipe. This is why I love soda bread. So simple, so easy and not waiting. Love all the detailed information . 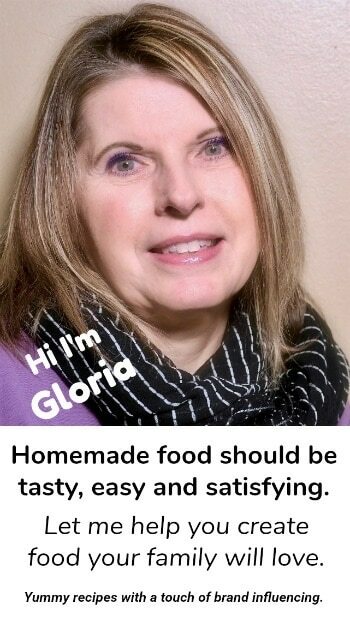 you provided Gloria. Need to try your recipe soon. Thanks, Veena, although you could do this with your eyes closed. All that talent in those cakes makes this look like child’s play. Well, that sounds like a great plan. ENJOY! I love homemade bread but not the time it takes to make. Thanks for this easy recipe! Can’t wait to try it. 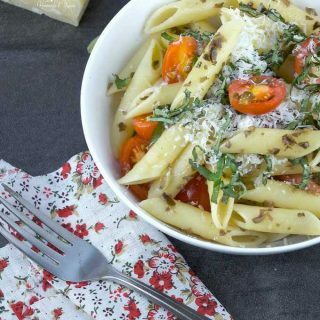 This is super easy to make any night of the week. ENJOY and thanks for stopping by. Oh my! I love a warm, toasty bread like this and am gonna try this one. I mean, the fact that it only takes 1 hour to bake it from scratch definitely wins. I agree this is a keeper. I know once you give it a try, you will make it often. Why am I not making this bread??? I’m not much of a bread baker, but am all about a no-knead no yeast bread. it sounds so easy to make and I’ll bet it’s delicious. I hope I get a chance to try it this weekend! I hope you do too. 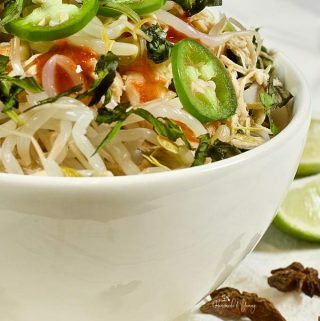 It is super delicious and quick to make. I can’t believe how quick to bake this is!! I love making bread too but my default recipe usually takes a couple of hours just the waiting/rising alone so lol. Can’t wait to try this out. Perfect for dunking into soup! Well when you want freshly baked bread in no time, this is the recipe for you. Hope you give it a try. That looks beautiful! I like that it seems so simple. I am not a baker but I’ve always wanted to make good homemade bread. Actually it’s on my bucket list. However so far I have not been successful so I’ll have to try this recipe. It looks like it would be perfect with a bowl fo stew or soup! This is super easy to make. I promise you will master it THE FIRST TIME!! Give it a try and see for yourself. I’m a fan of irish Soda Bread too! I love how easy it is and it always comes out moist and delicious. And I’m with you on reaching for it while it’s hot and slathering on the butter. Now I’m thinking I need this for dinner tomorrow. I think I need this for dinner EVERY NIGHT!! I now need to make this. You make it so simple and yummy to follow! Super easy for sure. I know it will turn out the first time. ENJOY! A friend of mine and her husband always made Irish Soda Bread and would deliver it to our house on St. Patrick’s Day. But they moved away and I’ve been thinking of trying to make some for us this year. Your recipe came just in time! Looks really good. This is so easy to make. A great way to have home baked bread all the time. I’ve never made soda bread but I really like the idea of making bread from start to finish in an hour. Hope you give it a try…it is super easy to make. Okay I didn’t know it was THAT easy! I love making bread and buns and all that, but it does take a long time. I will have to try this very soon! I love the idea of making bread without waiting for it to rise. 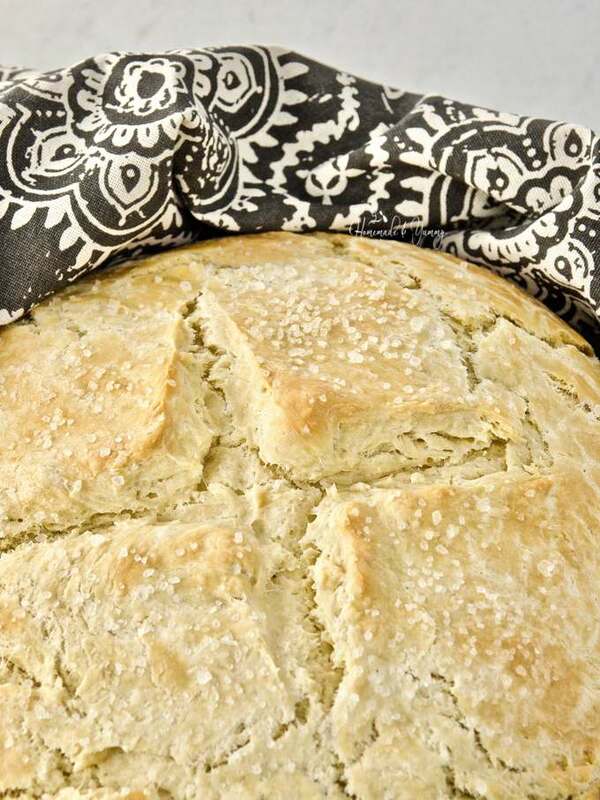 I don’t know if I’ve ever had Irish Soda Bread, but this looks great and sounds so easy. 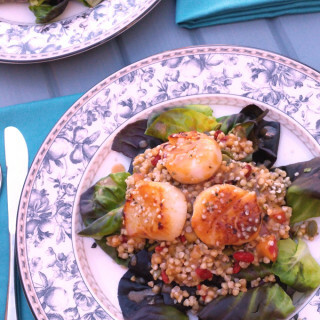 We love this, and it is so easy to whip up any night of the week. 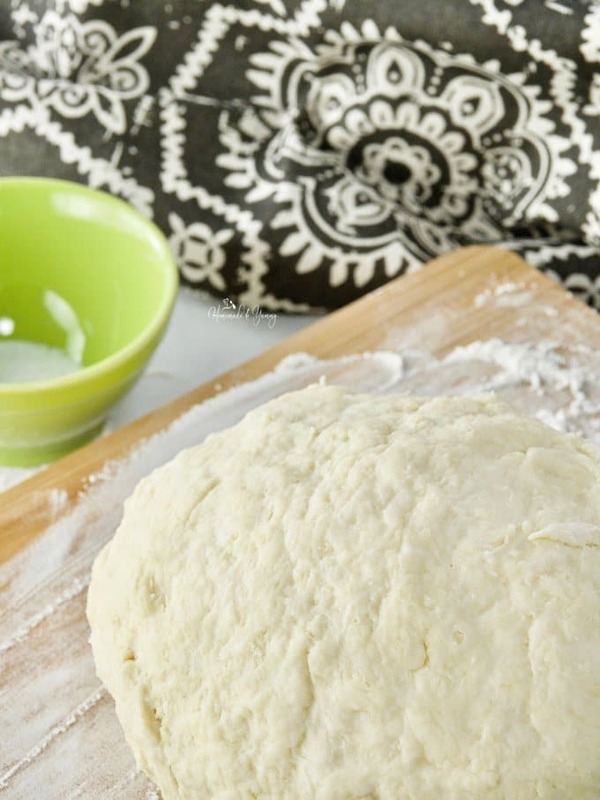 No kneading, no rising & no yeast – these are a few of my favorite things! HAHAHA…YES!! The bread is fantastic too. This looks so delicious. It would be great to whip this up when you don’t want to wait for yeast to rise. 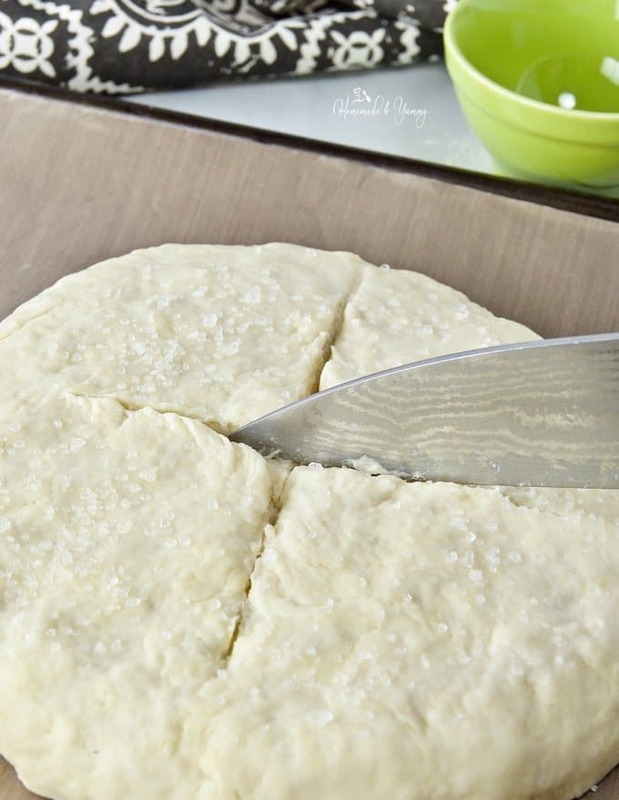 This is perfect for making bread in a quick and easy method. I’ve been experimenting with lots of yeast breads lately, but dislike the time it takes to knead and rise. This looks like the perfect easy recipe for bread! Will be making it this weekend! ENJOY….this never lasts long in our house. I love this Irish soda bread. It’s one of the easiest breads to make. Yes and so delicious too. When I read the part where you think breaking off a chunk of bread and slathering it with butter is fantastic, I knew we could be best friends. Really, there’s nothing as soothing and as therapeutic as warm, homemade bread. I was lucky enough to grow up in a home where homemade bread was all there way. My mom would make homemade bread twice each week, in large batches. I miss it tremendously! I’m just slowly practicing and perfecting my bread making skills, and I think this easy Irish soda bread would be a great place to start! Thanks for sharing!! I KNOW you will master this the first time. ENJOY! Yum — I love how easy and delicious this looks. We always have a St. Patrick’s Day party, and this bread will be perfect. Thanks for sharing! Perfect for St. Patrick’s day…enjoy, I know your guests will love it. I have never made Irish soda bread – sounds yum. The dough looks so pliable and easy to manage. I love how simple and easy this recipe is. Saving for later. This is such a quick and easy bread to make. Serves the purpose when you want fresh bread, but are pressed for time. Looks so yum! Love soda bread. Bookmarking this! This really is sooo easy to make. I bake bread quite often but I don’t know how come I’ve never baked Irish soda bread! That’ll be the next bread I bake for sure! This is so easy and delicious. Hope you enjoy it. Freshly baked bread is so good. Warm bread and butter is THE BEST!! Nothing beats a lazy weekend afternoon baking bread. This looks perfect! I know, just something so rewarding when you make it yourself. 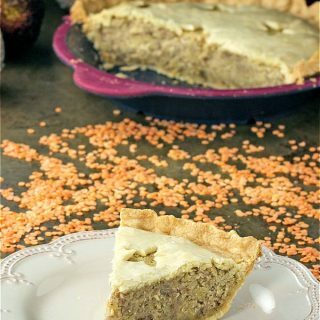 Yum, ”tis is perfect for this time of year hen it’s no too hot to turn he oven on! I really like how easy it looks, and love the thought of slathering a hot piece with butter! Yes…fresh hot bread out of the oven with butter is sooooo good. 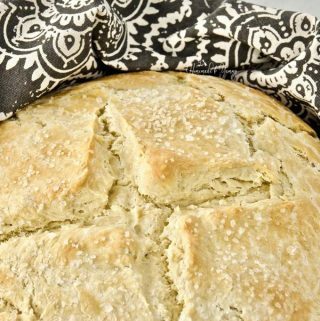 I love Irish Soda Bread and this looks so easy to make too! I’m going to give this a try. Baking bread does not get easier than this. It looks so fluffy and moist ! I love any recipe that has “easy” in front of it so looks like this is going in my recipe box ! Believe me…this is the easiest way to make bread ever. I can’t say I’ve actually ever had Irish soda bread, but like you said I also love having a nice hunk of bread to go with a big bowl of soup. The smell of fresh baking bread is one of my favorite smells in the world. I love how quick and simple the recipe is! This is my go to recipe when fresh baked bread is a must for any recipe. Looks amazing and so easy to do as well! Love it! Yes it is easy and delicious. Hope you give it a try. This looks like such an easy, tender loaf! Love that bit about the fairies, too – how cute! Yes…that is a cute little folk lore for sure. Those salt crystals on top! OMG! I could eat this entire loaf with an obscene amount of kerrygold butter on each bite 🙂 Can’t wait to try this recipe. Nothing beats freshly baked bread butter. I love homemade bread and this looks fantastic. I LOVE a good soda bread, and this looks so tasty! Perfect to go with a nice soup or stew! Yes….it is the perfect quick and easy bread to make for so many things. 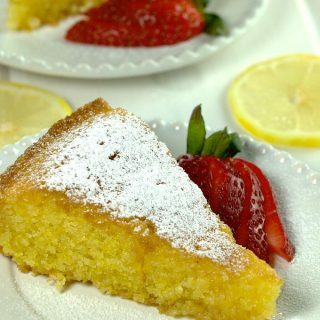 I do have buttermilk on hand and I am totally making this, YUM! Enjoy. 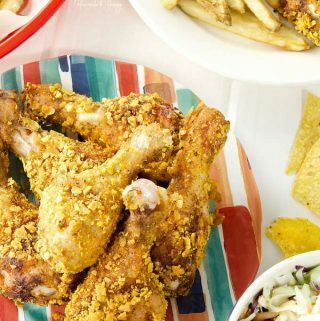 This is such an easy recipe….and totally delicious. Hope you give it a try. Such an easy recipe. Perfect to make whenever you want fresh baked bread. I, too, love how easy it is to make Irish Soda Bread. It really comes together so quickly, and I love that rustic, craggily texture. I hadn’t heard the folklore about the cuts in the top being to “let the fairies out.” How fun! I absolutely love that. I’ll have to tell my St. Patrick’s dinner guests this year when I put the soda bread on the table! HAHAH…yes I thought that was a cute little fact as well. Love Irish soda bread for both, it taste and its easiness to be ready in literally no time! Yours looks so good! I know….it really is the best of both worlds. Soda bread is the BEST! I grew up in Ireland and Soda bread was a staple in our house. 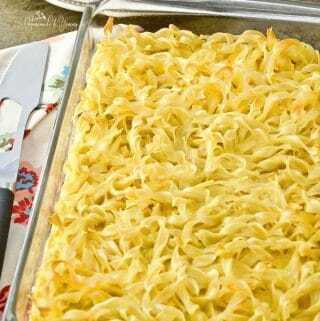 I haven’t made my own in years, but it is still up there in my list of absolute favorite comfort foods. I am looking forward to trying this version out! Well you certainly had the “real deal” in the UK. It would be great to taste it from there too. I cannot tell you how much I love Irish soda bread – although the version my Gram passed down has raisins and other nontraditional ingredients. I could eat this every day. Well I think any version would be delicious.